Entries 2016, 2015, 2014 and 2103, with contextual information. Inspiration for the painting: observing approaching weather whilst walking on cliffs above Stonehaven in Aberdeenshire. Vertical rain rods and apparent tranquility contrast a floating, tethered building straining against the silent wind from an approaching storm. Time appears paused, the calm before the storm. Trees growing within an old, high walled nursery are sheltered from the elements and thrive. Trees outwith this safe haven are exposed to the full impact of the weather. 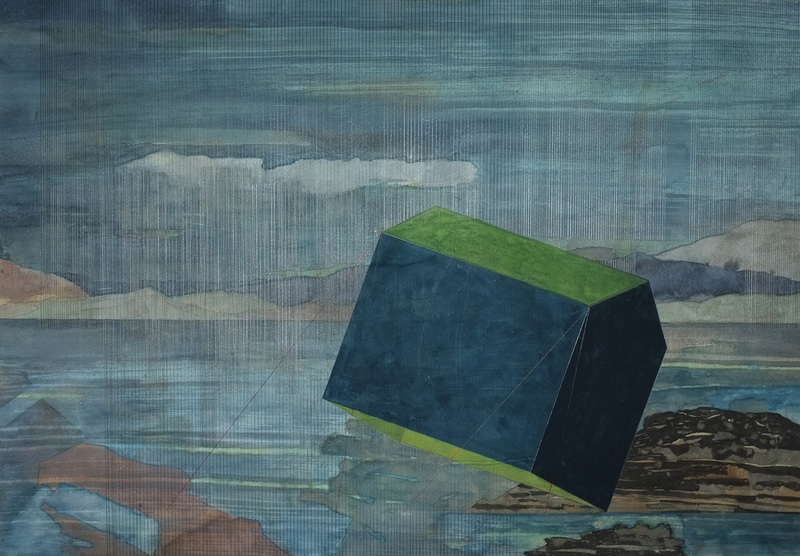 The painting invites the viewer to consider other scenarios where a protective environment can be fundamental to survival. Is in response to the recent unprecedented periods of extreme weather, resulting in major flooding across Britain. The painting partially reveals passing time, never-ending days of rain and the statistical recording and analysis of rainfall. It celebrates the altered landscape where sodden fields merge to form a new configuration with rainwater changing the normal lie of the land. A break in the clouds sheds light on the floodplain offering hope of better weather ahead. A series of observations from walks over several months around Stonehaven, where I live. 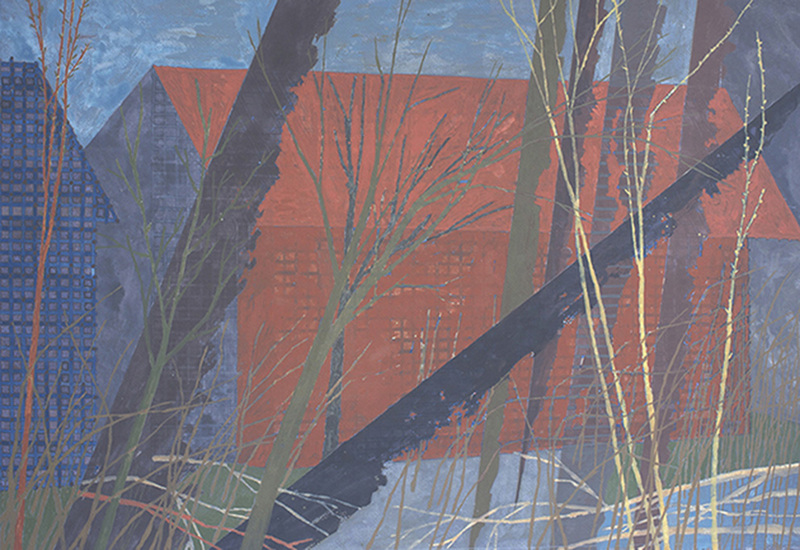 Depicting a recently painted building in a forest, storm-damaged trees and new growth, a personal narrative layering actual and remembered structures. The paint used to protect metal from rusting, intriguingly, cleverly is the colour of rust. It both protects against and merges with the rust. Rusting security grids on fisherman’s sheds by the harbour, allowing upper windows to open without weakening security. The natural cycle within forests, with evidence of storm damaged, fallen trees, lying rainwater and fresh growth. A rural, electricity substation, made secure by an open, metal grid, in the form of a building.